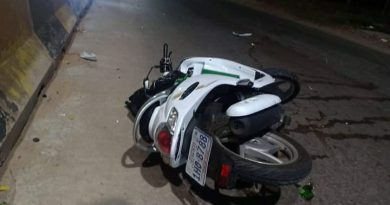 Svay Rieng: 2 police officers were injured after a car crashed into a property on National Highway 13 in Svay Rieng City on the night of 6 December 2018. The driver was a 28-year-old police officer in Po Chrum district, Svay Rieng province, who suffered minor injuries. His passenger, a 30-year-old male police officer occupations was also slightly hurt. Two other men in the car were unharmed. Hong Pov, the 40 year old owner of the house that the officers drove into, escaped without harm. The cause of the accident was given as driver error, after he became sleepy at the wheel. The injured were taken to hospital and the authorities took away the vehicle.